Enter for you chance to win an Austin Breakfast Adventure! Four grand prize winners will discover insights and ideas to create their own amazing Good-To-Go breakfasts . Don’t miss out on this exciting opportunity brought to you by Smithfield! Opt out of receiving emails from Smithfield. 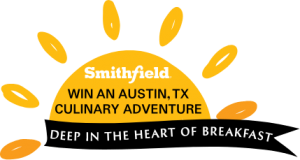 Smithfield Deep in the Heart of Breakfast Sweepstakes. NO PURCHASE OR PAYMENT NECESSARY TO ENTER OR WIN. A PURCHASE WILL NOT INCREASE YOUR CHANCES OF WINNING. Starts on 1/1/19 at 12:00:00 a.m. CT and ends on 4/30/19 at 11:59:59 p.m. CT. NOT OPEN TO THE GENERAL PUBLIC. Open to legal residents of 50 United States and D.C., who are 18 years of age or older (19 in AL & NE), who are owners or part- or full-time chefs/operators/decision makers in good standing with their employer that are responsible for purchasing meat products for their food service establishment. Void where prohibited. For complete Official Rules, click here. Sponsor: Smithfield Foods, Inc., 200 Commerce Street, Smithfield, VA 23430.